The Furniture of America Garvey Twin-Full Bunk Bed showcases a timeless space-saving design, a great addition to any children’s room. This piece showcases a robust wooden frame for long-lasting quality with Mission style inspired head and foot boards with slatted design. The top bunk comes with safety guard rails and ladder access. Finished in White. The Furniture of America Garvey Twin-Full Bunk Bed showcases a timeless space-saving design, a great addition to any children’s room. This piece showcases a robust wooden frame for long-lasting quality with Mission style inspired head and foot boards with slatted design. 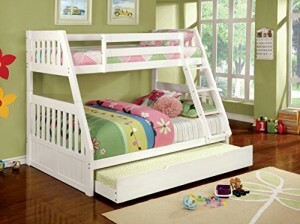 The top bunk comes with safety guard rails and ladder access. Finished in White. Trundle bed available separately. Made in Vietnam, assembly required. Overall dimensions: 56.75″L x 78″W x 66″H. All décor and items are not included in this offer unless specified.